Japan got seven Wii Virtual Console games last month while other regions got zero, but they still show no signs of stopping, as next month will offer another four. It's evenly divided between the Super Famicom and Neo Geo, with one of the games being another instalment in a certain Capcom series that ends with "X". Majin Tensei II: Spiral Nemesis — Another Megami Tensei series spin-off, which like the previous one is a tactical RPG similar to the Fire Emblem series. 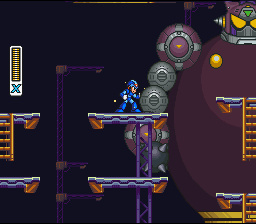 Rockman X2 — The second Mega Man X game, this one doesn't really change that much from the first. ASO II: Last Guardian — Released in the West as Alpha Mission II, this is a vertically scrolling shoot 'em up. World Heroes 2 Jet — The third title in the World Heroes series and somewhat of an extension to World Heroes 2, though it's a little odd that Japan is getting this when the fourth game in the series, World Heroes Perfect, is already available there. Japan's upcoming 3DS Virtual Console title will be the relatively obscure platformer Trip World for the Game Boy, which is somewhat of a spiritual successor to the also relatively obscure (But a bit of a cult classic) Mr. Gimmick! on the NES. They all sound great in theory. And while i'm not sure i'd get all of 'em... Do . Want . Europe is still waiting for Axelay, even though its been out in the US and Japan for over THREE YEARS !! Konami must really hate European gamers. I did try asking them a couple of years ago where it was, but they said they couldn't comment as they never comment on commercially sensitive release schedules. How commercially sensitive of them for not releasing it and missing out on easy profit! @ThumperUK. If your wanting to downlaod Axelay go to the wii system settings and change your region to either Australia or New Zealand and you'll be able to download Axelay. I was mad that Konami didnt release Axelay on the European VC until someone on NintendoLifes forums gave me this info for us Europeans to download Axelay. Come on Nintendo we havent had a wii vc title in ages us Europeans. Im still waiting for Mega Man X1!! X1 was rockin if you avoided getting the X-Armor which made the game laughably easy and unchallenging. X2 i haven't exactly played too much of. They definitly got some funkier and more creative bosses and stage design by the looks of it. While I'd prefer MM6, X2 is a sweet alternative. Yeah, we're not getting Axelay. There's also a lot of other games we're not getting. We did get some other Konami title instead of Axelay though which Australia didn't get. I forget which though. We didn't get Mega Man 5 and X1 because the 'cut-off' point happened before those two could be released. And World Heroes 2 Jet probably released only to have the whole series on VC even if Perfect had been released earlier. Maybe it's just me but I thought the X series got better with each release. Well up until X5 anyway and then it all went down the crapper. Now come on where's our VC games in other territories? We like classic games too dammit! But we've got not a Wii's VC game anymore! Nintendo of Japan... bite me! Or, preferably, remind Reggie that the Wii VC does still exist. I liked all 3 of the SNES MMX games, but I thought of MMX2 as the weakest of those 3, IMO. I might switch up my Wii shop region to get X2, & maybe something else. ... when I get a points card. "I might switch up my Wii shop region to get X2, & maybe something else. ... when I get a points card." @ 5. FigetingPigeon - Many thanks for telling me about how to get Axelay - it is very much appreciated!! Alpha Mission 2 is on the PSN. SNK still provides strong support for that service as opposed to the Wii. Anyway its a good game and worth a look. To those asking, no you cannot change your region to Japan. There are four (possible five) regions of Wiis that I'm aware of and two of them can be switched between different countries for sure. PAL Wiis cover PAL territories which happens to include Australia and New Zealand. I can take my PAL Wii and set it to UK, Spain, Germany, whatever, though if I do so I'll lose any points balace I have outstanding. Wiis sold in North America can be set to countries including Canada, Mexico and Brazil (pretty sure other countries south of Mexico as well). The Wii sold in Japan is like the DSi sold in Japan: Japan region. You cannot change the language or the country setting to anything else. There's a Wii sold in Korea; as far as I know it's a separate region. There may be one specifically for China as well, but I honestly don't know about that; maybe the Korean one can be switched to China? I want Mario Party 3 and Mega Man X2, and Earthbound, and Axelay. And if Nintendo doesnt give them to me next week I'm going to complain on forums about it for the next month! Maybe that will get them on the VC!